Antique Mughal Rug weaving was one of the most outstanding aspects of textile production in India under the Mughal dynasty from the late sixteenth to early eighteenth centuries. Indo-Isfahan types shared in the common repertory of later Islamic design that was used in contemporary Safavid Persian rug production. But others, especially those produced in Agra or farther south in the Deccan, have a distinctive Indian style, with highly naturalistic, almost tropical plants and flowers and a rich palette of deep reds, greens, and yellows. Antique Mughal carpets were court art and as such they have a regal, palatial aura redolent of a bygone era of luxury and imperial grandeur. Emperor Shah Jahan is the father of Mughal rugs. He conquered vast areas, built the Taj Mahal and established the tradition of rug weaving. The Pakistani city of Lahore, which was formerly part of the powerful Mughal Empire. 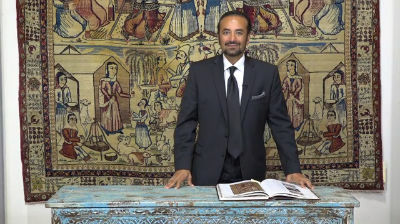 Was the dynasty’s first carpet-producing center. In Lahore, the Mughal’s distinctive Indo-Isfahan rugs were born. Although these carpets borrowed motifs from their Safavid neighbors. The Mughals depicted of distinctive manner that would never be mistaken for their Persian counterparts. Even Mughal prayer rugs depict novel botanical motifs that flourish under stately mihrabs. Furthermore, Mughal hunting rugs are similarly vivacious and full of vigor. They depict ferocious animals, horsemen and tropical beasts that are Indian natives. Like botanical Mughal rugs, these spectacular carpets illustrate the savage nature of the real world. Furthermore, the distinctive and beautifully drawn botanical motifs are not the only elements behind the stylistic richness of Mughal carpets. The empire’s expert dyers contributed to the vibrant, colorful style of these early rugs. Local dyers had access to a variety of essential dye stuffs, including red lac resin. Which helped produce the iconic scarlet hues found in regional rugs. Without these early Mughal rugs, carpet production in Agra, Amritsar and India’s major carpet-producing areas would never have risen to the level it did. In conclusion, centuries after they became created, these spectacular works of art became exude the palatial elegance of an empire that thrived in a bygone era.